Carol is the mother of a child who disappeared in March 2003. Her child was a 14-year old victim lured by a dangerous sexual predator. This perpetrator used church activities and hidden Internet contact to entice and threaten her child. On March 1st, her child left home. Within days, the child was taken 2,000 miles from home. Fortunately through the efforts of the Amber Alert, FBI, NCMEC, California Highway Patrol, and Michigan's law enforcement, the child was safely recovered near Reno, Nevada on March 23. 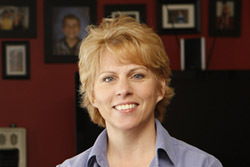 Since 2003, Carol speaks regularly on child exploitation and various child safety issues. In addition to being a board member of SPC, she currently is a member of the Michigan Human Trafficking Task Force and is a Team HOPE Coordinator with the National Center for Missing and Exploited Children.